Those comments got me thinking about my post from a couple of months ago when I confessed to being unknowingly baptized on two occasions. I promised in that post, which you can read here, that I would elaborate in a later post defending the doctrine and practice of infant baptism. I’m not going to spell it all out here, but I want to start in this post by laying a little groundwork. One of the aspects of the doctrine of baptism has to do with the question of timing, which came to the surface in the comments on the above meme. The question to be asked: when is the right time in one’s life when one is a proper candidate for baptism? Let’s talk about timing. A question that gets asked from time to time, at least in the part of the world where I live, goes something like this: “When were you saved?” Or perhaps, less frequently, “When were you born again?” These are questions about the timing of something. In the past, I would typically respond to such a question by appealing to the moment in my life when I professed faith in Christ, which was when I was ten years old. But as I have learned more of the nature of salvation, I’ve come to think a little differently about the time I was saved. When Scottish theologian Tom Torrance was asked this question he said something like this: I was saved about 2000 years ago in the death and resurrection of Jesus. Maybe that wouldn’t satisfy the one asking the question, but I like that answer! It locates salvation not primarily in the experience of it, but in the work of God in Christ. So when we take this to the salvation moments/experiences within our lives, we’re transported to another time. When I was baptized, I was taken back to that divine moment when the kingdom of heaven was inaugurated and Jesus was raised from the dead. When I announced my trust in and alignment with Jesus, I was incorporated into Christ’s story, not vice versa. Strictly speaking, it’s not my inviting Christ into my life. It’s Christ inviting me into his life. As the sacraments are the graceful expressions of Christ’s uniting us to himself, the sacraments are not about us and our timing; they’re about God and God’s timing. I’ll get around to talking more about age appropriateness in posts to follow, but first let’s get the story straight. Who is being brought into whose story? When we settle on “it is we who are entering Christ’s story,” which I hope we can do, then perhaps we will begin to see things not primarily through a chronological lens of time (Greek: chronos), but through what the Greeks called kairos. Per the Liddel & Scott Greek-English lexicon, kairos conveys something like “due measure, right proportion, fitness (or) the right season, the right time for action, the critical moment…” In this sort of time, we’re not caught up on seconds, minutes, hours, or even years or millennia, but the focus is on the rightness or appropriateness of a certain action. 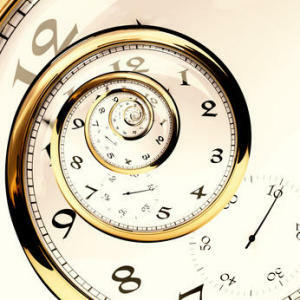 The measures of time we are accustomed to using do not apply, at least not primarily. Perhaps this idea sounds odd to some, but the point I wish to make is that salvation is a mystery of divine grace, which invokes and involves human faith and experience, but as it is the action of God, it is ultimately beyond our ability to fully comprehend, whether we are infants or adults. I hear some in other ecclesial traditions say that the sacraments (or “ordinances,” since some denominations avoid the term “sacraments”) are outward signs of inward faith or the decision to “receive Christ.” This notion appears to locate the validity of the actions in the consciousness of the one being brought into the waters of baptism or receiving the elements of Holy Communion. My community of faith (UMC) describes sacraments not as signs of faith, but as signs or means of grace. This means that the sacraments’ effectiveness is not dependent on human will or merit but instead on the will of God in Christ to convey grace through these sacred means. And I would suggest the moment in one’s life when one is baptized, the Church is witness to the rightness of (kairos) God’s claiming of that one’s life in uniting the baptized with Christ in his death and resurrection. Said differently, in baptism, our chronos fades into God’s kairos, and we begin to be, as Charles Wesley penned, “lost in wonder, awe, and praise” as we join Christ’s story. Another great article, Jeff! You are truly a wordsmith. Thank you, Jerry! God bless you, friend! Thanks, Greg! I hope you are well! Good article lookin fwd to more but I still call my2 boys babytism A Dedication we do have a good time Wed nites dont we?? We do have fun on Wednesday nights, Frances! And I recall you saying that. 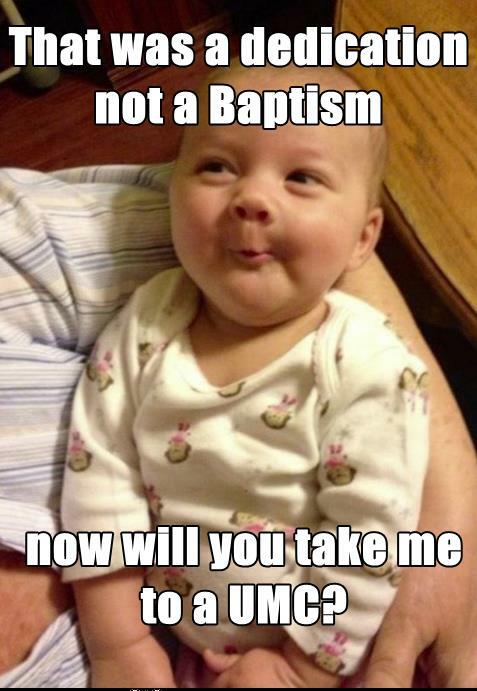 There are cases where some United Methodist pastors have done baby dedications, not applying water or saying, “I baptize you in the name of the Father, Son, and Holy Spirit.” Baby dedications were at one point common place in some parts of the UMC (and still are in some parts). In the last couple of decades, however, the UMC has undergone a renewed energy and emphasis on our sacramental theology, which is why there is more rigor on clergy being more trained on clearly communicating what we as United Methodists believe about baptism and the Lord’s Supper. I greatly appreciate that these remarks are being made, breaking the ice for sacramental discussion. That being said, there are two comments I would like to make. First, whereas I agree with the notion that Methodists baptize infants, can it really be said that United Methodists should only do so and not dedicate? The “United” carries with it the practical and theological import from the Evangelical United Brethren Church, which allowed both infant dedication and Baptism (hearkening back to the Mennonite origin of Martin Boehm, one of the founders of the United Brethren in Christ). Second, though I believe infant baptism has a place in various traditions, I am honestly only comfortable with it among groups in which confirmation is strongly stressed, if not a separate sacrament itself. The relationship between infant baptism and confirmation should be inseparable, one being an outgrowth that gives true meaning to the other. If confirmation is not held in high regard, the church has already forfeited its vows to support those who are brought forward for the sacrament. Thank you for your thoughtful response and engaging in this discussion. In response to your second comment, I agree that confirmation should be strongly stressed, though as a United Methodist I wouldn’t consider it a sacrament on the same level with baptism and Eucharist. The execution/communication of the clarity on our sacramental theology, especially our understanding of baptism, is still a work in progress, to be sure. And it will take time for it to be accepted by some folks (both clergy and laity) ushered in with a system where there was confusion on this issue. But I hope that through having conversations like these and bringing the issue before lay people, people within and without will be able to better articulate our approach to this holy practice. Peace be with you, Harry. One other note about baby dedications. Though this may be a generalization, but I would suggest that more often than not when baby dedications are requested in lieu of baptisms at UMCs it probably has more to do with the influences from the practices and culture of other dominant traditions (like Baptists in my part of the world), traditions in which people within congregations have been raised or attended before moreso than the practice established from the heritage of the United Brethren as a part of United Methodism. Perhaps that is different in areas where the United Brethren in Christ have more history and identity than where I am. I grew up a fundamentalist Baptist preacher’s son, very well educated in Baptist doctrine. I became an evangelical in my twenties: same doctrines just with a more positive emphasis. I am now a conservative (confessional) Lutheran. Why did I become a Lutheran if I was taught, and still believe, that salvation is received through faith alone, in Christ alone? How could I join a Church that believes that God saves and forgives sins in Baptism? Baptism is a work! I became a conservative Lutheran when I realized that the reason Baptists and evangelicals do not and cannot understand infant baptism and baptismal regeneration is that they do not understand how a sinner obtains FAITH! As I said above, I was a Baptist preacher’s son. When I was nine years old, I got into trouble, and my mother gave me a well deserved spanking. After the spanking, she talked to me about sin and that I needed to be saved. She led me in a prayer to ask Jesus to forgive me of my sins, come into my heart, and be my Lord and Savior. I remember feeling so good after finishing that prayer. I was saved! I was then told that God would now speak to me or move me or lead me to do things to follow his will for my life. All the Christians around me were talking about God moving them, leading them, speaking to them…but I just didn’t have the same intensity of feelings that most of them seemed to have. So when I was about 15, hearing a good Baptist sermon, I asked myself this, “Maybe the reason God doesn’t speak to me like he does other Christians is probably because I am not really saved! I didn’t really believe the first time. Maybe I didn’t fully repent. Maybe I didn’t have enough faith.” So I prayed the equivalent of the Sinner’s Prayer again, with all sincerity and contrition for my sins. I felt that rush of good feelings again. I was happy. I now knew that I was definitely saved! I left the Church altogether. I was not the only Baptist/evangelical to undergo several born again experiences because we didn’t FEEL saved. My mother, the pastor’s wife, several years later, the person who had “led me to Christ”, decided that she wasn’t really saved either, so she repeated her born again experience just to be sure. And several other people in my church repeated their born again experience for the same reason: they weren’t sure that they had done it right. If you go on your computer and google “how many times have you prayed the Sinner’s Prayer?” you will find other Baptists/evangelicals who have gone through the same experience. The problem with the Baptist/evangelical Doctrine of Faith is that it is based on US! Our salvation is based on us having the maturity and intelligence to make a free will decision to accept Christ into our hearts, So if later on in life we start to question our salvation due to not FEELING saved, what do we have to fall back on? Ourselves! Did I really repent? Did I really have true faith or was I trusting in my own faith? At nine years old did I really have the maturity to make a decision? MAYBE I DIDN’T DO IT RIGHT! So just to be on the safe side, I’ll sincerely repeat a version of the Sinner’s Prayer, and make 100% sure that, this time, I do everything right! So, in this plan of salvation, which is supposed to be a FREE gift from God, we turn it into something that depends on us…on us doing the born again experience correctly! What I have learned from Martin Luther and Lutheranism is this: salvation is ALL God! Salvation doesn’t depend on me at all! I am not actively involved in my salvation! Jesus Christ does it all!